Amid bar raids and the Red Scare, gay men in New Orleans established a vibrant culture. Read about the city's first first gay krewe in an excerpt from the new book Unveiling the Muse: The Lost History of Gay Carnival in New Orleans. The first gay Carnival krewe was the fantastic Krewe of Yuga. A mock ball was held in 1958 at the Uptown home of Douglas Jones, located at 1120 South Carrollton Avenue. Over the years, Jones had thrown parties to celebrate Carnival and view the Krewe of Carrollton parade, whose ranks included friends from the French Quarter. However, the great leap of faith that occurred at this auspicious moment was a shift from a loose-knit party to a more formalized costumed ball with a captain, queen and king, maids and debutantes, mimicking, and at the same time mocking, the traditional old-line krewes and their presentation of royalty. By creating their own krewe in a similar vein, this group made evident their own grand intentions in response to the great spirit of Carnival unique to New Orleans. The early part of the decade had seen the blossoming of a vibrant gay community in the French Quarter. Gay men and their friends gathered at various bars sprinkled throughout the old section of the city to gossip, drink, and socialize. An important meeting place was Dixie’s Bar of Music, where all were welcome. Everyone knew each other and recognized kindred spirits with the same sensibilities and cultural references. They enjoyed a protective environment where they could be themselves, and within this rarefied society, gay men especially thrived and became more visible. On Shrove Tuesday, the laws against masking in public were waived, and this was a call to arms, to leave behind all restrictions. The French Quarter came alive with the sound of these celebrations and was further colored by elaborate and surprising costumes, full of flair and camp. Jack Uther Robinson Jr, who lived in the French Quarter in the early 1950s and later became an important fashion photographer in New York City, began to take photographs of his friends as they celebrated Mardi Gras in the French Quarter. The future founders of gay Carnival were already something of a legend within this community, and here he captured in exciting detail the relaxed atmosphere on the sidewalks and inside Miss Dixie’s back courtyard, whose side entrance had the sign For Male Bachelors Only. Elmo Avet, the last Queen of Yuga, appeared sipping a cocktail in his mermaid costume with strategically attached sailor. Clay Shaw, local preservationist, impresario, and later target in the Kennedy assassination investigation, was costumed as Socrates with false beard and toga, standing completely at ease, chatting with friends. JoJo Landry as Lady Godiva paraded around the streets with an abandon only possible during Carnival, and Douglas Jones, sporting a fashionable Pierrot guise, sipped whiskey from a flask. 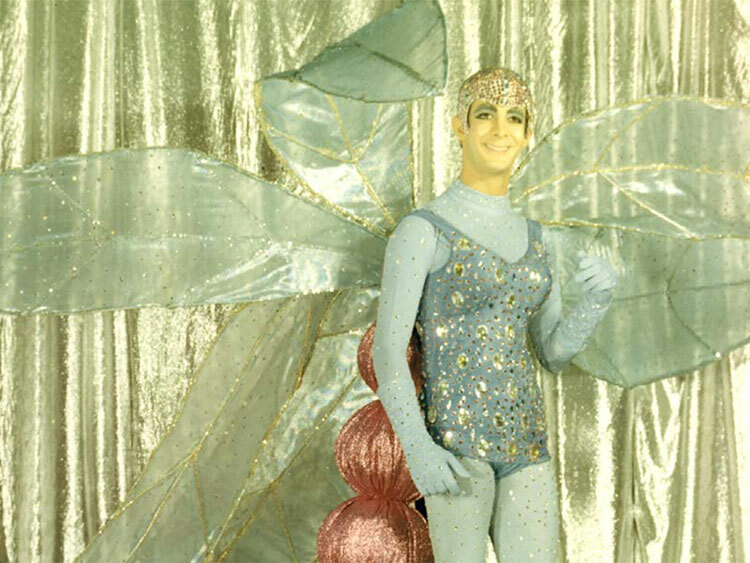 This was a time when costumes were allowed and the rigid mores of society were loosened somewhat, allowing a larger space for gay expression. These incredibly candid photographs presaged the creative force and drive that would soon come together to form the first gay Carnival krewe in New Orleans. In the French Quarter, this close-knit society was already frequenting gay bars along Bourbon Street, such as Miss Dixie’s and the Bourbon House. These clubs existed despite the harsh laws against homosexuality because of payoffs and back-door deals. Most clubs in the Old Quarter knew the drill and learned to survive and prosper. Tennessee Williams wrote about the gay scene in his Notebooks. He duly noted his day-to-day friendships, bar hopping and liaisons with a candor that underscored the openness of the period. He mentioned several bars, such as the Starlet Lounge, Mack’s, the Rendezvous, and Miss Dixie’s, and how effortlessly he moved within this group of intimate friends. Similarly, John Rechy devoted a large portion of his seminal City of Night to gay Carnival in New Orleans, mentioning the old Bourbon House and a gay bar nearby with a side courtyard, fictionalized as the Rocking Times bar. Rechy’s book follows the exploits of a gay hustler, based on Rechy himself, as he visits various cities, including New Orleans. One of the krewe members worked for a daycare facility in Metairie off Veterans Boulevard behind the giant Schwegmann’s grocery. The school had a large dance studio called the Rambler Room and was chosen as the site for the next Krewe of Yuga ball. At night, the hall was empty, and the neighborhood, surrounded by a wooded area towards the lake, was relatively quiet. The 3800 block of Edenborn Avenue seemed a perfect hide-away for another even more opulent ball. Personalized invitations soon appeared in the mail, and the returning queen of Yuga and her court promised an extravaganza never before seen. So successful was the 1961 ball that the Rambler Room once again hosted the 1962 ball. The newly formed Krewe of Petronius, made up of friends and a few members of the Krewe of Yuga, would also hold their first ball at the same location, but one week before the Krewe of Yuga’s fifth presentation. The invitation for the 1962 Yuga ball was a masterpiece of draftsmanship by Stewart Gahn Jr, a member of the krewe. Its elaborate drawing depicted a coat of arms and spoke to a type of pseudo-royalty inherited from the old-line krewes, strongly resembling those forgotten invitations by the Twelfth Night Revelers. The invitation came from the reigning Yuga Regina herself, Claude M. Davis Jr, requesting the presence of her loyal subjects. However, police, alerted to an out-of-control party, came out with the K-9 division and mounted policemen. What followed became a story cloaked in as much legend as actual fact. News spread quickly of the raid as several escapees reached the French Quarter. Miss Dixie, especially incensed by the news, leapt to action. She called her lawyer and grabbed wads of cash from the registers of her bar to help bail out her boys. Yvonne Fasnacht and her sister Irma had become pillars of strength in the gay community, and she boasted that her bar had never been raided or threatened, owing to her political savvy and connections with the police. However, she could not prevent the names of all those arrested from appearing in the newspapers during the weeks that followed. Most lost their jobs. William Woolley and Elmo Avet sat dishing the dirt the next morning as the usual coffee klatch gathered at the Bourbon House Restaurant and Bar across from Miss Dixie’s. Woolley had also escaped the dragnet along with Avet. “He came up to a neighboring house of an elderly half-blind lady and asked to use her phone,” explained Carey, again recalling another legend of the raid. “Still in drag and covered in mud, Woolley explained that his date had gotten fresh. What else could she do under the circumstances but help a gal in need!” Jerry Gilley, who would later become an important captain in the Krewe of Amon-Ra, sat in silence as the story unfolded between gasps and sighs. “I had not attended the ball, my lover fearing that his job would be compromised, but I was very much frightened by all the accounts. Simply terrifying,” said Gilley. “No one wanted to attend any balls for a long time.” Avet vowed vengeance while John Dodt nursed his black eye. Douglas Jones, JoJo Landry, and Tracy Hendrix appeared the next day in a state, having suffered the crowded pens adjacent to the Jefferson Parish Police Station, the cells having proved inadequate for all those arrested. “I was in my Mariachi costume with my tasseled hat and tight matador pants. You couldn’t even go to the restroom,” lamented Hendrix. But instead of abandoning their dreams for gay Carnival, everyone pulled together and continued the tradition with the Krewe of Petronius. Fortunately, Petronius eventually changed the format of their balls with state charter in hand. Now they were a legitimate Carnival club and their guests would have to attend in formal wear. Only the members of the krewe would appear in costume on stage with a spectacular tableau to amuse and entertain their friends. Other legends persisted like a ghostly aura surrounding the Krewe of Yuga. The most tantalizing of stories, which came out during that morning’s many tales, concerned a female impersonator professionally known as Candy Lee, who had gotten her start at the My-O-My Club on the Lakefront. A part-time bartender at the infamous Tony Bacino’s bar, she lived on Decatur Street and knew Tennessee Williams when he returned to New Orleans in the late 1950s for inspiration. Williams became caught up in Candy Lee’s life story, which some say inspired his 1958 short play, And Tell Sad Stories of the Death of Queens. This play was unique in that it was unapologetically set in a gay milieu with gay characters. It was never performed during his lifetime but now enjoys a wide circulation. Set in the French Quarter, the play tells the story of Candy, abandoned by her older lover at a turning point in her life that was to prove her undoing. The real Candy Lee, already notorious as a raunchy French-speaking Cajun drag queen, had blamed all too loudly those she thought had caused her arrest at Bacino’s bar in 1958. She and the other bartenders were constantly harassed by the police and arrested five times. One of the tight-knit group of gay men who had begun the first gay krewes, by the early 1960s Candy Lee had fallen from grace and had been banned from all balls. Even Tune, a well-known black doorman at the bar, once admitted Candy’s role in the whole affair. Never one to confess any of her shortcomings, she instead sought to betray those whom she felt had betrayed her. Douglas Jones himself avowed that he believed the tale, and thus her fate was sealed when she had called the police on the night of the fifth Yuga ball to complain about a disorderly and chaotic party. Thus, the legend survived, and the story of the police raid still held onto its air of mystery and intrigue. Clay Shaw, or Madame Queen, as he was affectionately called among his friends, was a likely participant in the revels of the first gay krewe. Already having a certain celebrity as the managing director of the International Trade Mart, little happened within the French Quarter gay scene that he did not know about, or had a hand in. He greeted his friends by name at Miss Dixie’s, where everyone congregated on weekends. A fixture in the revitalization of the French Quarter, here within this gay world, he felt at ease and comfortable enough to be himself with his friends. And Shaw was a devout follower of all things Carnival. During his trial for conspiring to assassinate President John F. Kennedy, another shameful attack from his arch-enemy, District Attorney Jim Garrison, several friends testified in a deposition that Shaw had all sorts of lavish and flamboyant costumes hidden away in his apartment closet, strange and wonderful costumes of every creation imaginable. It would only seem natural that Shaw was indeed part of these early gay Carnival parties with a costume for every occasion and, even more telling, had a hand in the formation of the first gay Carnival krewe. Some say he was a member of the mysterious Steamboat Club, and several attendees remember him at the meetings. At the very least, he attended the first Yuga costume balls, as had many of the denizens of Miss Dixie’s, all part of this circle of complicit comrades. And with that, the Krewe of Yuga, having shown brightly like a flaming star, simply faded from the pages of history, and the legacy of the ill-fated krewe became obscured after its untimely demise in 1962. Yet out of disaster, a fierce determination and resolve took hold of those who had suffered the most. Although the Krewe of Yuga had managed only five presentations, the last two balls had become more elaborate and were superbly crafted spectacles. Invitations were produced and a royal court presided over the costumed revelers, mixing liberally with their subjects. The creative lightning bolt unleashed by the first gay krewe could not be contained even in the face of great disaster. Many of those arrested carried high the torch of gay Carnival. Already, the Krewe of Petronius, made up of some members of Yuga, pulled together with determination and artistry to continue this tradition despite the odds. Carlos Rodriguez, the first queen of Petronius, and Otto Stierle, sixth queen of the krewe, both had been arrested and yet continued on to triumph in many dazzling spectacles. JoJo Landry, a minor legend herself, made her mark within the resilient Krewe of Petronius as well. William Woolley, who narrowly escaped capture, went on to great acclaim within Petronius and later founded his own krewe, the Mystic Krewe of Celestial Knights. Jim Schexnayder, arrested like so many others, regrouped and helped form the third gay Carnival club, the Krewe of Amon-Ra. Tracy Hendrix would help to found the Krewe of Armeinius several years later. “My name was printed in all the newspapers along with the rest. It was a terrifying experience I’ll never forget. It was all over before we had a chance to really get going,” he recollected more than fifty years later. Elmo Avet, the enigmatic provocateur and one of the original forces behind gay Carnival, encouraged the Krewe of Petronius to regroup and establish a lineage whose thread continues on today. By the mid-1980s there were over a dozen gay krewes, mostly holding their balls at the old Saint Bernard Civic Auditorium downriver in Chalmette, famous as the site of the battle of New Orleans in 1815. Each year, these krewes sought to out-perform their sister krewes with even more dazzling tableaux, even more sensational costumes and sets, music, and special effects. These were the years that audiences remembered best when the krewes were at their finest and never disappointed. Balls were free but tickets were hard to come by, which only made them more desirable and sought after. Formal wear was de rigueur, and many who did not heed this rigid requirement were turned away. Even Uptown matrons fought among themselves for tickets from their hairdressers. Sadly few could recall those who had set everything in motion. But the legacy of the first krewe, the one that started it all, the fabulous Krewe of Yuga, would not only be the creative excellence seen on these stages around town but in the sheer will to continue on in the face of doom, the dreaded years to come when the ranks of all the krewes were decimated by AIDS. This steadfast resolve, not to let the great work of gay Carnival fall into the darkness of the past, has continued on until today, where we see the Krewes of Petronius, Amon-Ra, Armeinius, and the Lords of Leather still holding balls each year and inspiring members of the new gay krewes, such as Satyricon, Queenateenas, Mwindo, and Narcissus. The dynamic and daring Krewe of Yuga rightfully takes its place within the history of Carnival in the great city of New Orleans. 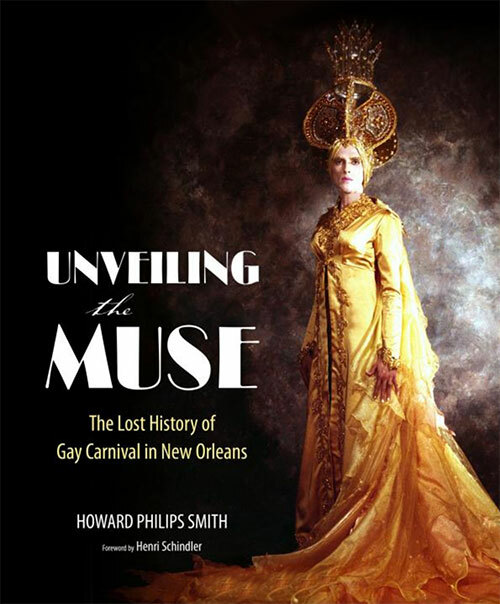 Excerpted from Unveiling the Muse: The Lost History of Gay Carnival in New Orleans by Howard Philips Smith. Reprinted courtesy University of Mississippi Press.